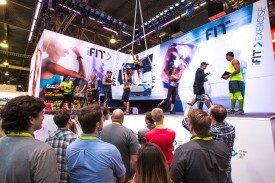 iFit Coach is a radical new way to connect hardware and software, data and results, consumers and experts. The service gives members expert recommendations for the four pillars of health: exercise, activity, nutrition and sleep. The daily plan is personalized and dynamic, updating automatically based on ongoing data flow from a network of iFit-connected devices including wearables, fitness equipment at home and club, mattresses, weight scales, running shoes and more. Throughout the day, the iFit Coach receives data from the devices and adjusts its recommendations in real time, depending on what a consumer eats and how they move — or not. For example, if your stated fitness goal is to lose weight, and you eat a donut at a work meeting, iFit will provide a quick after-work workout to cancel the effect of those calories or adjust your nutrition recommendations for dinner. The iFit Coach™ mobile app is the foundation of your $9 a month iFit subscription — a steal compared to the costs of hiring a coaching team of personal trainer, registered dietician, sleep counselor and running coach. The app tracks your progress against daily fitness and health goals in real time. iFit-connected fitness equipment has iFit technology integrated in the tablet consoles of leading home fitness brands such as NordicTrack and ProForm and the club brand FreeMotion Fitness. Calories ingested are easily entered into your iFit tracker, the mobile app, or through the iFit website. With accurate data and feedback on the four fitness-crucial categories, iFit Coach™ wakes you up with a game plan for the day personalized for each iFit member: cardio and strength workouts, activity and movement goals, calorie intake goals, meal plans, recipes and grocery lists and the optimal bedtime. Each morning’s recommendations are based on the iFit member’s fitness objectives, past history on iFit, and are subject to real-time adjustments throughout the day. The service is dynamic, and automatically adjusts elements such as portion sizes, based on activity throughout the day or yesterday’s missed workout. The iFit Coach™ mobile app will be available in February on the App Store and Google Play for iOS and Android devices. Follow @iFit on Facebook, Twitter and Instagram. iFit® technology is a registered trademark of ICON Health & Fitness, the world’s leading fitness innovator, based in Logan, Utah.